← Time to Reconnect, Recharge. Usually, I think of fire as a tool, one of my favorite tools. Today, I think of it as a predator. 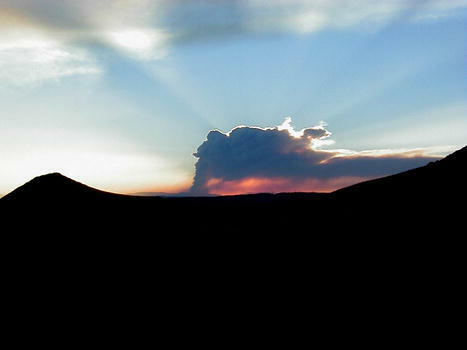 I can’t help but wonder if it can reach me… the giant wild forest fire that I can see just over the hill. I can’t see it right now, because there is a mountain in the way. I was driving home from work as happy as ever to be going home for the day, when I looked up at the sky. I almost drove right off the road. There it faced me, the giant menacing column of heavy white smoke, threatening to come ever closer. It was too far away and behind the mountains for me to see the base where the flames were, but I was still shaken up a bit. I couldn’t help but think, what if? What if today was my last day in this house that I grew up in? What if tonight was my last chance to pack up all of my belongings and leave? What if my story became the same as those in Colorado? After freaking out and going to google weather warnings and seeing that my town is in fact under a severe fire weather warning, I asked my dad whether “what if?” was a possibility or not. My dad reassured me that “We don’t live in a forest, so we are safe from forest fires.” That still doesn’t make me feel much better, because we live right at the base of a canyon. He said that the fire is still a really long way away, and that I shouldn’t worry about it. Maybe it’s paranoia from listening to NPR all day at work. I’m still worried. I have half a mind to start packing valuables… but that would be crazy, right? This entry was posted in Creative Writing, Deep Thought, Fear, Natural Disaster, Nature, Painting, Photography, Science and tagged colorado, family, fear, fire, fire warning, fire weather, forest fire, friendship, home, jackson hole, natural disasters, NPR, worry, wyoming. Bookmark the permalink.